Hello and welcome to our live coverage of stage 6 of the Volta a Catalunya. Today's stage runs 169km from Valls to Vila-Seca. Today's stage has been slightly shortened from its original state. A northern loop has been added before the day's categorised climbs, while the flat run-in has been drastically shortened – the sprint at Botarell was originally 80km out and is now 35km from the finish. Here's a look at the original profile for comparison. Nevertheless, we should still be in for a sprint finish today, especially after the outcome of yesterday's stage when Max Schachmann (Bora-Hansgrohe) attacked late on to hold on and ruin the sprinter's day. Originally, today had looked like a day for the breakaway, but likes of Michael Matthews and his Sunweb team should be keen to bring it all together before the finish in the coastal town of Vila-seca. The peloton will be out in the neutralised zone at the start of the stage now. André Greipel (Arkéa-Samsic) doesn't start today's stage. Yesterday his team did a lot of work before he got dropped late on and finished 2:40 down. It has been another disappointing week for the veteran German after Paris-Nice. Álvaro Cuadros (Caja Rural-Seguros RGA) is the other non-starter. The 23-year-old (riding second wheel below) was out in the break on stages 1 and 3, and lay joint-third in the mountain classification. Here's Arkéa-Samsic's press release on Greipel's withdrawal. The team says he needs to recover after giving a lot of effort over the first five stages of the race. His next races will be Scheldeprijs and Paris-Roubaix. It's uphill from the off today, though there are no categorised climbs until just after 100km into the stage. That's a long way for the breakaway to wait for a reward. They'll surely be fighting over a place in the breakaway regardless though. No word as to the latest action in the race just yet. Florian Vachon (Arkéa-Samsic) and Oscar Cabedo (Burgos-BH) have abandoned the race in the early kilometres of the stage. Astana's Miguel Ángel López retained the race lead yesterday. There shouldn't be any problems for him today either, leaving tomorrow's traditional circuit race in Barcelona as the only obstacle left to manoeuvre for the Colombian. 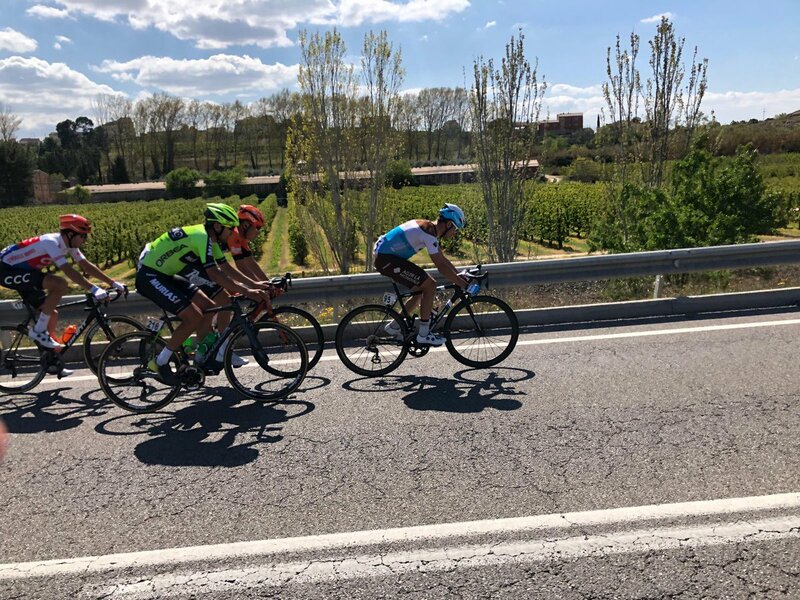 Geoffrey Bouchard (AG2R La Mondiale), Josef Černy (CCC Team), Mikel Iturria (Euskadi-Murias), Oscar Riesebeek (Roompot-Charles) and Floris De Tier (Jumbo-Visma) have gone on the attack. They're two minutes up on the peloton at the moment. Our new podcast has hit the air. Check out the latest episode, which includes exclusive interviews with Matteo Trentin and Larry Warbasse, below. Wilco Kelderman (Team Sunweb) crashed out of the race late on yesterday. The Dutchman was leading the chase of Max Schachmann on behalf of his team's sprinter Michael Matthews when he slid out on a downhill corner. Today the team announced the news that he suffered a fractured neck verterbrae and broken collarbone in the crash, which will require surgery. Here's our full story. The peloton are 2:30 behind the peloton currently. They're heading down into the valley before heading back uphill for the long drag to the feed zone and the town of La Pobla de Cervolès. Here's a shot of the break, from the race Twitter feed (@VoltaCatalunya). Yesterday saw Max Schachmann (Bora-Hansgrohe) take a Volta a Catalunya stage win from the breakaway for the second year in a row. Read our full race report, including results and photos, here. Our man in Catalunya Alasdair Fotheringham got the story after the stage too. Here's Schachmann talking us through how he won stage 5. Bahrain-Merida and Dimension Data are among the teams working at the front of the peloton. Phil Bauhaus and Ryan Gibbons will be their options for the sprint, should it come to that. There are two classified climbs on today's stage, though we're still around 30km away from reaching the first of them. Both climbs are third category. The Coll d'Abarca (5.8km at 3.2%) comes after 101km, and the Coll d'Alforja (4.4km at 5%) comes 16km later. Two intermediate sprints at Botarell (at 135km) and Cambrils (at 150km) follow. It's still Dimension Data and Bahrain-Merida working at the front of the peloton as we head inside the final 100km. They're 2:40 behind the break. The break are heading towards the top of this long drag uphill, and are now 2:20 up on the peloton. They're under 20km from the first climb of the day. Over in Belgium, Zdenek Štybar (Deceuninck-Quick Step) won yesterday's E3 BinckBank Classic, outsprinting an elite group at the finish for yet another Quick Step one-day race win. Read our report here. As we head towards the first climb of the day, none of the men in the break today are in any danger of challenging Thomas De Gendt at the top of the mountain classification. Josef Černy (CCC Team) has just two points, compared to De Gendt's 51. The break will be starting the Coll d'Arbarca in a few kilometres. And the break reach the first climb of the day. Just 1:20 between the peloton and break now. The break are 1.5km from the top of the climb. Iturria leads De Tier, Černy, Bouchard and Riesebeek over the summit of the day's first climb. Now a descent before kicking back up for the Coll d'Alforja. Just 1:10 for the break now, with 60km left to race. They'll be climbing the next classified climb soon. Bahrain-Merida are still driving it at the head of the peloton. It's lined out on the descent. The break are working well together but the peloton are keeping them on a tight leash. The break are on the climb now. 3km to the summit. Thomas Leezer (Jumbo-Visma) has a puncture on the climb. No drama as he gets a wheel change and is quickly back up and running again. There's a small group off the back of the peloton. It's unclear what the cause was, but the group including Marc Soler (Movistar) and Michael Matthews (Team Sunweb) are quickly back with the peloton. Matthews is one of the favourites for the stage today. He'll have the likes of Daryl Impey (Mitchelton-Scott), Alejandro Valverde (Movistar), Ryan Gibbons (Dimension Data), Patrick Bevin (CCC Team), Phil Bauhaus (Bahrain-Merida), Jay McCarthy (Bora-Hansgrohe) and Mikel Aristi (Euskadi-Murias) for competition at the finish, should the peloton catch the break in time. Bouchard leads De Tier, Riesebeek, Iturria and Černy across the summit. There's a 17km descent to the sprint at Botarell now, followed by another descent to the sprint at Cambrils. A flat 20km to the line follows that sprint. With 45km left to race, the gap is up a bit. Now the break are 2:20 up on the peloton. Bahrain-Merida are still leading the peloton. A handful of Trek-Segafredo and Dimension Data riders are mixed in there too. Here's a shot of the break from earlier in the race. They're currently 1:40 up on the peloton with 35km to race, and are 1km from the sprint in Botarell. The break roll over the sprint. Bouchard leads Černy, Riesebeek, De Tier and Iturra across the line. Both break and peloton are flying downhill right now. 1:20 between them as they head into the final 30km of the stage. The peloton is strung out all the way down. 5km until the sprint in Cambrils for the break. They're holding their gap well, but 20km of flat road after the sprint will be tough to stay away on. Iturria drops back from the break. Their job just got a bit tougher. The break's advantage is under a minute now. Looks like the peloton have upped the pace. It doesn't look like we'll see a repeat of yesterday's breakaway heroics here. Just 35 seconds between the break and peloton now as they ride along the coast road. The on-screen graphic shows speeds of 39km/h for the break and 43km/h for the peloton. Simon Yates (Mitchelton-Scott), Oscar Rodriguez (Euskadi-Murias), Anthony Delaplace (Arkea-Samsic) and Maurits Lammertink (Roompot-Charles) have hit the deck. They're all back up and running fairly quickly, except for Rodriguez who looks to be hurt. Possible left leg/arm injuries for Rodriguez. Meanwhile the Sunweb train leads the peloton, just 10 seconds behind the break now. It doesn't matter now but De Tier led the break over the final sprint of the day. "The final 400 metres are fairly flat, straight and on widish roads – nothing too tricky. But there's a kick up with about 1.8km to go and then a double 90 degree bend just before the final straight." We're into the final 10km now. The peloton is all together. Here's an in-depth look at the final 3km, straight from the roadbook. Meanwhile, Brice Feillu (Arkéa-Samsic) tries an attack from the peloton. Feillu is caught by the Movistar-led peloton. Movistar are riding for world champion Valverde today, of course. Quite a few roundabouts in this final 10km. No problems in the peloton though. The peloton head back to the seafront. Movistar really driving it in a bit of a headwind there as they hit the seafront. Some small gaps in the peloton. Niklas Eg (Trek-Segafredo) and a Katusha rider have crashed. Eg looks in some pain. Pavel Kochetkov is the Katusha man. He's back up and running though. Mix of teams up front now. Astana, EF, Movistar, Bora. The peloton is really lined out here. There are two more roundabouts left to navigate and then a left-right with about 4-500 metres to race. Davide Formolo (Bora-Hansgrohe) has put in a dig. He's hanging a few seconds off the front. Race leader Miguel Ángel López (Astana) has gone on the attack too! What?? Interesting move, to say the least. The peloton close the duo down. Nice try López. The peloton turns left into the final kilometre now. Formolo, López and Mas up front ahead of the sprinters! Matthews takes up the sprint first. Him vs Bauhaus! And Matthews hangs on to win the sprint! López was up there with them too. It was a very close finish indeed. A decent group of stragglers are just crossing the flamme rouge right now. There was quite a bit of damage done in that finale. Matthews took the win by a tiny margin there, maybe a tyre width. Daryl Impey was third ahead of Patrick Bevin. López ended up in eighth at the finish, just ahead of Rafał Majka and Enric Mas. It was a sprint stage! "It's been a great week so far. Two stage wins, a second and a fourth. Unfortunately yesterday we had a really bad crash with one of my teammates Wilco Kelderman. This one's for him today. "I'm pretty happy with how it's been so far. Tomorrow in Barcelona is a beautiful stage. I've always watched it on television and always wanted to be a part of it so we'll try and finish it off with another win but tonight we'll celebrate this one." Here's a shot of the dash for the line, from Getty Images. Just look how close it was between Matthews and Bauhaus. Tomorrow's final stage is the usual race around Barcelona. It's 143km long and features eight laps around the now-customary Parc de Montjuïc circuit, including a 2.2km, 5.3% climb. It's one for the puncheurs and GC men – Simon Yates beat Marc Soler by 13 seconds last year, while Alejandro Valverde took the win in 2017. Race leader Miguel Ángel López leads Adam Yates by 14 seconds, and Egan Bernal by 17 seconds, so the overall win could still be up for grabs tomorrow afternoon. That's all from us today. Be sure to tune in tomorrow for our live coverage of the final stage of the Volta a Catalunya!